Dim sum workers at Yank Sing restaurant. Photo credit: Craig Lee / San Francisco Chronicle. 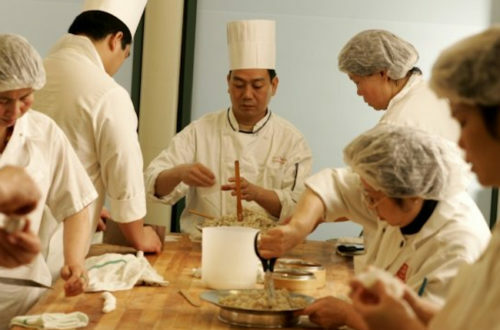 Last week, nearly 300 dim sum workers won a landmark $4 million dollar settlement from major San Francisco-area restaurant chain, Yank Sing. The workers, who did not have the benefits of a union, were forced to endure multiple labour violations, including retaliatory action and wage theft. With help from the Asian Americans Advancing Justice | Asian Law Caucus and Chinese Progressive Association, the workers organized a “do-it-yourself” collective bargaining action, including strikes and walkout during high volume business hours. The action worked: in response to the collective action, Yank Sing came to the bargaining table and agreed to the massive settlement, along with agreeing to offer workers a raise, holiday pay and more transparency in scheduling and worker rights. Yank Sing also agreed to offer full healthcare coverage for their workers, a benefit currently made available by only 10% of restaurants nationwide. The workers now will get their back pay checks, plus health care and other benefits, and see their base pay raised to $11.25 an hour. The Chinese Progressive Association hopes to see a ripple effect in other Asian restaurants. A report earlier this year revealed that 40% of restaurant workers live at the poverty line, and might be classified as “working poor”. Poverty rates are especially high for women and minorities, and are reduced when workers are able to unionize. The intersection between the AAPI community and the fight for labour rights is tightly-knit and profound; in particular, the fight has often involved the political work of Asian American women. In the 1980’s, an historic garment workers’ strike involved over 25,000 of NYC Chinatown’s sweatshop seamstresses, most of them Chinese American women. A mass walkout resulted in the signing of a union contract between the seamstresses and their employers. Today, the fight for labour rights has focused on low-wage workers in the restaurant and retail industries. Earlier this week, Wal-mart workers engaged in an unprecedented nationwide strike and walkout, with workers at Target threatening to do the same this Friday; the workers are seeking a living wage. Moreover, this fight continues to impact Asian Americans, and more disparately Asian American women: 22.3% of Asian American women work in the service industry, including food service. 12.3% of Asian American women live below the poverty line, and 5.38% of Asian American women are classified as “working poor”. Even regardless of gender, working-age Asian Americans are more likely to be low-income working poor than non-Asian Americans, particularly if they are recently immigrated. Poverty rates are even higher among some AAPIs. Consequently, as the fight for labour rights heightens in this country, AAPI must be certain to make our voices heard. Labour rights have been an Asian American issue for generations, and it remains an issue that should mobilize all Americans, today.